Halloween is less than a month away, and it’s time to decide what you want to be this year. With so many choices, the act of choosing one costume can be daunting. Makeup and makeup tricks are a huge part of setting your costume apart from the rest, and not to mention application is incredibly fun as well, especially with friends! This is the time to get creative and step outside the box of what you look like in your day to day life. Get daring with colors and practice the look you want to achieve for the ultimate look you desire. There are various ways in which someone could choose to apply eye makeup for Halloween. This all depends on what it is you want to be for Halloween, first and foremost, and aside from that you will need to choose the colors and techniques you want to use based upon what you’re going for. Aside from eye makeup, there are other important aspects of applying Halloween makeup such as lips and cheeks. Again, depending on what you’d like to be this Halloween, angles, and tricks just might make (or break) your costume. Defining lines, bright colors, blending and smoothing are all important factors to consider during the application process. Below are some pictures of lip makeup application for Halloween. Perhaps this list can give you an idea as to how to craft and create a design all your own! 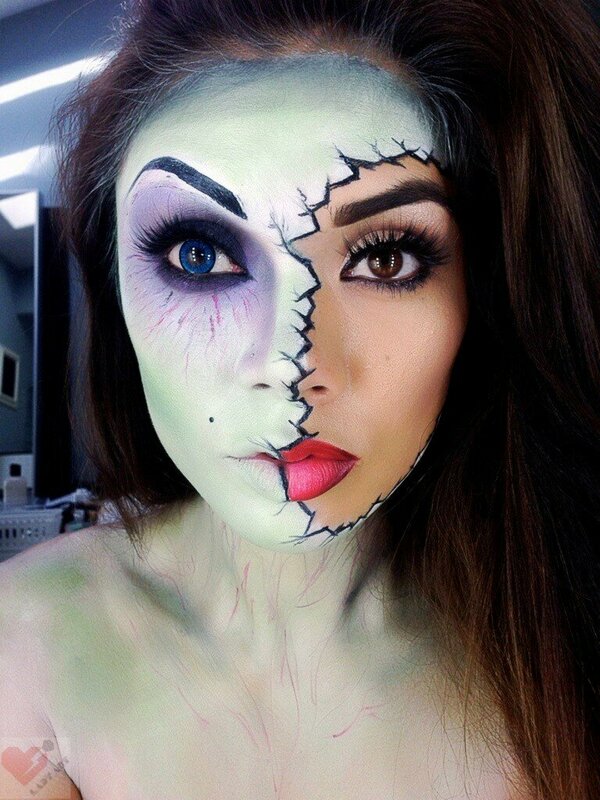 Even if you don’t have a costume to wear for Halloween, utilizing some of these makeup ideas will have you looking Halloweentastic in no time at all! Your cheeks are the defining point of you face. If done right, makeup can be used to completely modify your facial structure’s appearance. It’s not overly difficult to apply makeup to your cheeks – and with a little practice, you’ll soon be applying like a pro! Here are some fantastic cheek and facial makeup strategies and ideas you can use to develop your look for your upcoming Halloween parties, or even just to practice and have fun with any time of year! As you can see, the pictures shown are some incredible depictions on transforming your face into your artist’s canvas. Halloween makeup application should be about having fun, being creative, and finding the beauty in makeup. What are some of your favorite Halloween makeup styles? Leave us a comment below, and fill us in!